1.2. Online store is the online store available on the website http://www.keramikams.lt where the Buyer, which is not registered to the system of the Online store, can buy products offered by the Seller. 1.3. The Seller is JSC Suvena, registered and operating in accordance with the laws of the Republic of Lithuania, registration No. 147579612, VAT payer’s code LT475796113, operating at the address Berzu str. 4, 36237 Panevezys, Lithuania, website http://www.keramikams.lt. 1.4. The Buyer is a person who meets the requirements specified in clause 2.2 of the present Sale-purchase rules and who has acquired products in the Online store. 1.5. Sale-purchase agreement means sale-purchase agreement concluded by the Buyer and the Seller consisting of products order application to be submitted by the Buyer to the Seller through the Online store and the Sale-purchase rules with subsequent amendments and supplements. 1.6. Personal data - means any information directly or indirectly related to the buyer. 1.8. The third country shall mean a country, which is not a member of the European Union or other country of the European Economic Area. 1.9. The parties - the buyer and seller together. 2.1. The Buyer confirms the Rules with them, placing the check mark, following the purchase and sale rules and confirming the order. In this way, the rules approved by the Parties are legally binding document outlining the Buyer and Seller's rights and obligations, the acquisition of goods and pay for them in terms of delivery and return procedures, responsibilities and other countries with supply contracts – www.keramikams.lt related conditions. 2.2. By the present Sale-purchase agreement, the Seller undertakes to sell and deliver the product to the Buyer and the Buyer undertakes to accept the product and to pay for it a fixed amount of money under the terms and conditions of the Sale-purchase agreement. 2.5. The present Sale-purchase rules together with the order submitted by the Buyer become the Sale-purchase agreement entered into by the Buyer and the Seller and serves as a binding legal document for both Parties. 2.6. In case of necessity or in the circumstances stipulated by legal acts of the Republic of Lithuania, the Seller has the right to amend, amend or supplement the Rules. Buyers will be informed about this by signing up at www.keramikams.lt or by purchasing the goods for the first time after the entry into force of the new edition of the Rules. 2.8. If the seller provides a right or an obligation to provide information to customers via e-mail or documents, in all cases, the acting and the buyer e-mail address belonging to the Seller placing the responsibility of the buyer. 2.9. 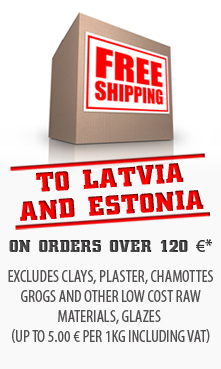 Each Purchase Order is stored in the www.keramikams.lt database. 3.1. The Buyer shall have the right to cancel the Purchase-Sale Agreement that was concluded in the Online shop by notifying the Seller of that no later than within 14 (fourteen) calendar days from the delivery of the item in accordance with the procedure specified in the Civil Code of the Republic of Lithuania and these rules of purchase and sale. 3.2. The right to cancel the concluded Purchase-Sale Agreement shall not be applicable to legal persons and their authorised representatives. 4.1. After submitting an order in the Online store, the Buyer shall pay for the products and accept them under the procedure established in the present Sale-purchase rules. 4.2. The Buyer, having noticed that the order form incorrectly indicated the product or certain data, must immediately inform the Seller about this. If the Buyer notices an error before receiving an e-mail confirming the dispatch of the goods, the Buyer immediately informs the Seller thereof by e-mail to info@keramikams.lt. On the subject line of the e-mail, the Buyer must specify the order number (reference to this number is given in the confirmation letter sent by the Seller) and the wording "Wrong order". To change the order of goods until the dispatch of the goods, the Buyer may contact the Seller by phone number +370 45 433569. If the error is noticed after the receipt of an e-mail confirming the dispatch of the goods, the goods are returned and replaced in accordance with the procedure specified in Chapter 12. 4.3. The goods which were chosen by the buyer are reserved and the Seller only undertakes a purchase-sale transaction only when the Seller receives a notice from the Buyer's bank about the payment for the selected goods unless agreed otherwise that the buyer pays the cash account provided to him at the time of delivery / delivery. 4.4. By refraining from the Purchase Agreement, the Buyer must inform the Seller by e-mail or telephone, and by mutual agreement in any of the above ways, that the seller will agree on the time and place of return of the goods. 4.5. By using the services of the Online shop, the Buyer undertakes to follow other conditions of these rules of purchase and sale that are clearly stated in the Online shop as well as not violate the legislation of the Republic of Lithuania. 4.6. The Buyer from the third country undertakes to pay the custom fees that are applicable in its country. 5.1. The Seller shall have the right to set the minimum size of the item basket at its discretion, i. e. the minimum amount that has to be reached in order to start the Buyer's order. The size of this amount shall be specified in the Online shop. 5.2. If the Buyer tries to impair stability of operation the Online store and its security or violates the liabilities specified in section 4 of the Sale-purchase rules, the Seller has the right to immediately and without notice restrict or suspend the Buyer’s possibility to use the Online store or to annul the Buyer’s registration. 5.3. The Seller has the right to suspend or terminate operation of the Online store without giving prior notification to the Buyer. 5.4. The Seller has the right without giving prior notification to the Buyer to annul his/her order if the Buyer fails to pay for the products within 3 (three) workdays from the day of the order submission. 6.1. The Seller undertakes to provide the possibility for the Buyer according to the conditions that are specified in these rules of purchase and sale and in the Online shop to use the services provided by the Online shop. 6.2. The Seller undertakes to deliver the items ordered by the Buyer to the address specified by the Buyer in accordance with the conditions specified in paragraph 9 of the rules of purchase and sale. 6.3. If the Seller is unable to deliver the ordered item to the Buyer, the Seller undertakes to offer to the Buyer an analogous one or the item, the properties of which are as close as possible to the ordered one. If the Buyer refuses to accept the identical item or the item that is similar in its properties, the Seller undertakes to return the money that the Buyer paid for the items within 5 (five) working days, if the Buyer had made the prepayment for the items. 6.4. The seller provides for certain product groups a guarantee of the quality of the items valid for a certain period, the specific term and other conditions of which are specified in the descriptions of such goods. 7.1.3. by call (+370 45 433569, +370 612 60001). 7.4. Purchase and sale transaction between the buyer and the seller shall be considered concluded from the moment when the buyer online shop formed a shopping cart, specified delivery address and other necessary information required for the transaction conclusion, familiar with these rules, click the button "Order", and is valid until the full post under these rules execution. In cases where the buyer does not agree to all or a particular part of the rules, he must not put the order. 7.5. Each Purchase and Sale Agreement concluded between Buyer and Seller is registered and stored in the database of the Internet shop www.keramikams.lt. 8.1. The items that are sold in the Online shop shall be specified together with their price of sale. The prices of the items in the Online shop and in the formed order shall be specified in euros including VAT. The prices of the items for the Buyers - participants of loyalty programme shall be shown with the already applied discount. The price of the items shall not include the item delivery costs and the custom taxes that are applicable in the Buyer’s country. Item delivery costs shall be covered by the Buyer after the selection of the specific type of the item delivery. The costs of the item delivery shall be specified in the order form in euros. 8.2.3. payment in cash delivery/ collection time - The buyer pays for the goods to their delivery/ withdrawal (transmission - reception) time. 8.3. If the Buyer selects payment methods that are specified in paragraphs 8.2.1 and 8.2.2 of the rules of purchase and sale, the Buyer undertakes to make the prepayment for the items. If the Buyer selects the methods for the payment for items that are specified in paragraphs 8.2.1 and 8.2.2 of the rules of purchase and sale, the formation of the shipment of items and the calculation of the delivery period commences from the crediting of payment into the Seller's account. If the Buyer selects payment method that is specified in paragraph 8.2.3 of the rules of purchase and sale, the formation of the shipment of items and the calculation of delivery period commences from the reception date of the Buyer's order. 8.4. The Seller shall not bear responsibility for the actions and omission of banks, correspondents and other third parties, including faulty operation of communication lines if this results in non-fulfilment or inept fulfilment of operations of the Buyer’s bank account management. 8.5. The Buyer shall be notified about the time of order fulfilment by email. 9.1. When ordering the items, the Buyer shall specify the item delivery location in the application, when the item is delivered to the Buyer through our transport, the courier service or at JSC Suvena in Beržų street. 4, Panevėžys, Room 201 from 8:00 to 17:00 (I-V), when the Buyer indicates that the item will be taken away at the seller's home. 9.2. If the Buyer chooses to withdraw the goods from the company when the goods are ready, the Buyer is informed by e-mail or by telephone. 9.3. The items shall be given to the person who shall be specified in the order form. When the specified person cannot collect the items and the items were delivered to the address that was specified by the Buyer and according to the other information specified by the Buyer, the Buyer shall have no right to present complaints to the Seller due to the delivery to the improper subject or other irregularities of the delivery. 9.4. The items shall be delivered by the Seller or its authorised representative. 9.5. The items shall be delivered to the Buyer within the time limits that shall be individually agreed upon between the carrier and the Buyer. In Lithuania, Latvia and Estonia, the carrier shall contact the Buyer via the phone number that the Buyer specified in the order form. 9.6. When there are no required items in the Seller's warehouse, the Buyer shall be informed of the lack of items that were ordered and of the time limit for the delivery of items. 9.7. In all the cases, the Seller shall be released from the liability for the violation of delivery times if the items are not delivered to the Buyer or their delivery is delayed due to the fault of the Buyer or due to the circumstances of force majeure. 9.8. During the delivery of the items, the Item shall be transferred to the Buyer by giving the invoice (bill of lading) or other document that registers the transfer - acceptance of the shipment. 9.9. During the delivery of items, the Buyer together with the Seller or its authorised representative shall check the condition of the shipment. After the Buyer signs the invoice (bill of lading) or other document that registers the transfer - acceptance of the shipment, it is deemed that the shipment is transferred in the proper condition. If the Buyer notices that the package of the delivered shipment is damaged (crumpled, wet or damaged externally in other way), the Buyer shall immediately note that in the invoice (bill of lading) or other document that registers the transfer - acceptance of the shipment, and in the presence of the Seller or its representative draw up the shipment damaging deed of a free form. If the Buyer does not draw up the free form shipment damaging deed in the aforementioned way, the Seller shall be relieved from the liability against the Buyer due to the damage of the items if such damage was caused by the damage to the packaging or occurred during the moment of its occurrence. 9.10. All delivery prices in Lithuania and other countries are presented in the section "Delivery of goods" in the online store. 9.11. When delivering the items outside Lithuania, item delivery price shall depend on the country to which the item will be sent, weight and dimensions of the item. 9.12. When delivering the items to the third countries, the Buyer shall pay the custom charges if such are applied in the country of the Buyer as well as perform the customs procedures in the country of the Buyer. 10.1. The properties of each item that is sold in the Online shop are specified in the web page www.keramikams.lt. 10.2. The Seller shall not be responsible for the fact that the colour, form or other attributes of the items that are in the Online shop can differ from the actual size, forms and colour of the items due to the peculiarities of the display used by the Buyer. 10.3. When the Seller does not provide warranty to certain types of items, the warranty established by the legislation for such items shall be valid. 10.4. The warranty service for the goods is provided by the Seller, or the Buyer is directed to the after-sales service centers. 11.1. The deficiencies of the sold items shall be eliminated, poor quality items shall be exchanged and returned in accordance with the Rules of Retail Sale approved by the decree No. 738 of the Government of the Republic of Lithuania of 22 July 2014 “Regarding the Amendment of the Decree No. 697 of the Government of the Republic of Lithuania of 11 June 2001 “Regarding the Approval of the Rules of Retail Sale”. 11.2.6. the document that confirms the acquisition of the item is presented (register receipt, invoice, document that proves the acceptance of the item). 11.3. The costs of item shipment/delivery shall be covered by the Seller when the Buyer sends the items to be returned to the Seller or for replacement due to the deficiencies of the item or for the elimination of deficiencies or to be checked, if the deficiencies are identified in the items that are sent for return or replacement. In case the deficiencies in the items are not identified, the shipping costs shall covered by the Buyer. When replacing the items with those of other size, colour or model the repeated delivery of items shall be free. The Buyer and the Seller agree on the repeated delivery or collection of the items via email or telephone. 11.4. Are being returned with other items, according to paragraph 12.2 of the rules of purchase and sale, the Buyer must specify the items that it wants to return and the reasons because of which the items are being returned in the system of the Online shop. If the value of the replaced item is higher than that of the returned one, the Buyer shall pay the difference of the price by one of the payment methods that shall be specified in section 8 of the rules of purchase and sale. If the value of the replaced item is lower than that of the returned one, the Seller shall return the difference of prices to the Buyer. 12.1. The Buyer being a natural person shall have the right to cancel the agreement concluded within fourteen days without specifying the reason and without incurring other expenses, except for those that are specified in Article 6.22811 of the Civil Code, except in case of the exemptions that are specified in part 2 of Article 6.22810 of the Civil Code. The Seller shall not grant such right to the Buyer who is a legal person. 12.2. In order to return the item in case that is specified in paragraph 12.1 of the rules of purchase and sale, the Buyer shall submit its clear decision to the email address info@keramikams.lt. In the field “Subject” of an email, the Buyer shall enter the number of VAT invoice for the purchase of items and a note “Returnable items”. When returning the item, the presentation of the copy of the document (VAT invoice) that confirms the acquisition of the item shall be mandatory. 12.4.6. the item that is being returned must not lose its commercial appearance due to the fault of the Buyer (except for the changes of appearance that are unavoidable in order to check out the item). The Seller shall notify the Buyer within 14 (fourteen) days if the item that was returned meets the aforementioned conditions. 12.7. The duty to prove that was adhered to the requirements of the legislation regarding the cancellation of the agreement shall be taken by the Buyer. 12.8. When the Buyer exercises the right to cancel the agreement that is specified in paragraph 12.1., the obligations of the parties to perform the distance agreement or the agreement that was concluded outside the sale premises, or to conclude the distance agreement or an agreement outside the sales premises if the Buyer did submit the request to conclude one, expire. 12.9. The Seller promptly, but no later than within fourteen days, from the day, when the Seller received the Buyer's notification regarding the cancellation of the agreement, shall return to the Buyer all amounts paid by the Buyer, including the item delivery costs paid by the Buyer. When returning all payable amounts to the Buyer, the Seller shall use the same payment method that was used by the Buyer, when paying to the Seller, unless the Buyer clearly agreed to another method and if the Buyer does not incur any additional costs. 12.10. In cases, when the Buyer returns only one or several, but not all items that were delivered, the item return costs shall not compensated to him, if the amount of delivery does not depend on the quantity, value or other properties of the delivered items. In cases, when the amount of delivery depends on the quantity, value or other properties of the delivered items, the Buyer shall be returned the share of the delivery costs by which the costs of delivery increased when compared with one that would have been paid by the Buyer if he had not ordered the item (s) that is (are) being returned. 12.11. The Seller shall not obliged to return to the Buyer additional costs that formed due to the fact that the Buyer clearly selected another method of delivery instead of the cheapest standard one offered by the Seller. 12.12. The Seller can withhold the amounts from the Buyer that it paid, till the items are not returned to the Seller or till the Buyer presents proper evidence that items are shipped to the Seller, depending on which occurs faster. The Seller shall notify the Buyer via the email of the fact that the items that are being returned were received. 12.13. If the Buyer has delivered goods not like in the order, the Buyer must immediately, but not later than within 7 (seven) working days, inform the Seller via e-mail info@keramikams.lt or by calling the phone numbers: +370 612 60001; +370 45 433569. The seller undertakes at his own expense to take such goods and replace them with suitable goods. In case the Seller does not have ordered goods, he returns the money paid to the Buyer for the items. 12.14. The Buyer must, without delay and not later than within 14 (fourteen) days after the date of notification of the withdrawal of the Contract, send or send the Goods to the Seller or another person authorized by him. After the buyer's right to withdraw from the contract, the Buyer is faced with direct costs of returning the goods. 12.15. The Buyer shall send or transfer the items to the Seller or to another person that it authorised, promptly, but no later than within fourteen days from the submission of the notification regarding the cancellation of the agreement to the Seller. After the Buyer exercises the right to cancel the agreement, the Buyer bears the direct costs of the return of the items. 12.16. The Buyer shall be responsible only for the reduction of the value of the item, which occurred due to the actions that were not necessary the determination of the item's nature, properties and functioning. The Buyer shall not be responsible for the reduction of the value of item, if the Seller did not submit the information to the Buyer about the right to cancel the agreement in accordance with paragraph 7 of part 1 of Article 6.2287 of the Civil Code of the Republic of Lithuania. 12.17. When the Buyer exercises the right to cancel the concluded agreement, the additional agreements shall be automatically terminated without any expense of the Buyer, except for the expenses that are specified in this Article or Article 6.22812 of the Civil Code of the Republic of Lithuania. 13.1. The Seller shall not be responsible for the procedures that are applicable in the customs of the third countries, i. e. the Seller shall have no influence over the work time limits of the customs, also custom fees or other charges of the third countries that are related to the custom fees. The Buyer shall assess additional time and financial costs that could occur due to the sending of items to the third country. 13.2. The Buyer shall be liable for the actions performed using the system of the Online store. 13.3. The Seller shall be exempt from any liability in cases when the Buyer ignored the Seller’s recommendations and his/her liabilities and failed to familiarize with the Sale-purchase rules, although the Buyer had a possibility to familiarize with them. 13.4. The Seller shall not be liable for the links to the websites of other companies, institutions, organisations or persons available in the Online store and for any information available in those websites or activity of other companies, institutions, organisations or persons. The Seller does not supervise and control the aforementioned websites and does not represent those companies, institutions, organisations and persons. 13.5. If the Buyer fails to pay the customs fee and cannot collect or receive the items, the Seller's fulfilment of the Purchase-Sale Agreement shall be deemed proper. 13.6. In event of failure to execute the Sale-purchase agreement or inappropriate execution of the Agreement, the guilty Party shall compensate direct losses incurred by other Party, i.e. the expenses incurred due to the actions of the guilty Party. 14.1.JSC Suvena respects everyone’s right to privacy. Personal data such as: name, surname, title of the company, address, phone number, email address and any other data provided during registration for e-shop account, shall be used for the purposes of: processing order of goods, issuing financial documents (such as invoices), solving problems related with delivery of the goods, carrying out contractual obligations and with user’s agreement for direct marketing goals. 14.2.1.Data operator and www.keramikams.lt operator (hereinafter refered to as Seller) is JSC Suvena, legal entity’s code 147579612, VAT No. LT475796113, with its legal address at – Beržų g. 4, LT-36237, Panevėžys, Lithuania, email address – info@keramikams.lt. 14.2.2.Natural person or legal person that purchased goods at www.keramikams.lt hereinafter referred to as Customer. 14.2.3.Handling of Customer’s personal data is managed by Law on the Legal Protection of Personal Data of the Republic of Lithuania and other relevant national legislation including these Rules. 14.2.4.Customer’s personal data is collected on the basis of legal framework and processed honestly and accurately. 14.2.5.JSC Suvena is registered on Personal Data Controllers’ register, identification No. P5744, registered on 2013 December 19. 14.3. Seller ensures personal data entity’s rights under Law on the Protection of Personal Data and other relevant legislation. Seller uses Customer’s personal data for e-commerce goals (i.e. order fulfilment, warranty services). 14.3.1.Upon ordering goods Customer shall provide Seller necessary information for the pre-invoice and to ensure delivery, such as: name, surname, phone number, address, email address, and other relevant information. Seller confirms that such data shall be used only during ordering and delivering of goods. Seller legally commits not to disseminate and pass on such information to third parties, except to Seller’s partners providing delivery services and/or other partners providing services related with the delivery and handling of goods. Any other personal Customer’s data shall be passed on to third parties ONLY with Customer’s agreement. In all other cases personal data can be revealed to third parties in accordance to national legislation. 14.3.2.Customer has a right to get access to personal data and has a right to request a change of incorrect personal data by writing an email to info@keramikams.lt with data provided. Alternatively, Customer can call +370 45 433569. In such cases Seller must make changes as soon as possible, but no longer than 2 (two) working days. 14.3.3.Seller is obligated to ensure security of Customer’s personal data and to carry out appropriate technical and or organisational measures for personal data protection from illegal erasure and/or accidental change or reveal and any other illegal actions. Seller commit to ensuring that all staff members involved shall respect the confidential nature of information. Seller shall keep Customer’s personal data not longer than required by personal data management goals and national legislation. 14.3.4.Personal data is managed using safe means, protecting data from illegal erasure, illegal reveal or other illegal actions. Physical and technical measures have been implemented to secure all information that is collected during provision of our services. DISCLAIMER: even despite all measures to secure personal data, no website, online transaction, computer system or wireless network is completely safe. After the last time from using our services personal data shall be kept for 3 years, at the end of this period personal data shall be erased without possibility to restore it. Erasure of personal data shall be ensured by a responsible person. 14.4. By agreeing with these Rules, Customer agrees that cookies will be used and stored on Customers device when browsing www.keramikams.lt. 14.4.1.1. After providing personal identification document to Seller or electronic communication tools or in accordance with the national legislation, that allows to identify a person, Customer has a right to get access to personal data and examine how personal data is managed, i.e. receive information from which sources data has been collected, for what purpose data is managed, to whom data is provided, request a change of data or seize management of data in case when data is managed not in accordance to the Law on the Legal Protection of Personal Data of the Republic of Lithuania. 14.4.1.2. Other rights provided in Law on the Legal Protection of Personal Data and other national legislation. 14.5.Request to change data, erase data or seize personal data management must by expressed in writing or in person at Sellers’ place of business. 14.6.1.1. Required cookies: such cookies are required for websites functionality and access to secured areas of the website. Without these cookies online transactions could not take place. 14.6.1.2. Action cookies: cookies collecting information what websites and if any errors are received by the user from said website. These cookies do not collect information that would allow to identify user and information that is collected is anonymous. These cookies are used to improve website performance. 14.6.1.3. Functional cookies: these cookies allow website to keep your chosen options (name, language, region) and offer updated, personalised functions. Information collected by these cookies can be made anonymous. It does not collect data from other websites. 14.6.1.4. Target or promotional cookies: such cookies are used to display personalised advertisements. These cookies also limit the number of same advertisements to measure effectiveness of advertising campaigns. 14.6.1.5. No personal data is collected using cookies. 14.6.2.If required more information regarding cookies can be found at www.aboutcookies.org where independent information about disabling cookies using browser settings and how to remove already existing cookies is stored. Information on how to remove cookies from mobile device can be found at manufacturers’ user guide. 15.1. Sorting is one of the most important activities that everyone can contribute to reducing the environment and the pollution in Lithuania. When sorting waste, it does not fall into landfills, but is recycled or used to extract energy, and thus less polluting our environment. Thus, each of us has a very important contribution: we save resources, fight against global warming, save energy, reduce landfills. 15.2. sorting is not complicated. The three colored containers always remind us that glass packaging and waste are traveling in green, in the blue - paper and carton packaging, and the yellow container comes mainly with different types of waste: plastic, metal and composite (multilayer) packaging. 15.3. Although the myth prevails, only packaging that is washed is suitable for sorting and processing, but this is not true. As technology progresses, sorting is becoming an increasingly simple activity for us, so we do not need to wash packaging or peel off labels. Most importantly, there are no liquids on the packaging that can spray clean containers in the container. 15.4. JSC "Suvena" takes care of sorting waste and reminds that waste from electronic equipment can not be disposed of in containers for household waste. When exposed to the environment (water, soil, atmosphere), the waste can contaminate it with hazardous toxic substances. Therefore, each of us must ensure that the waste electrical and electronic equipment gets into specially designated areas. - call on electric and electronic equipment managers to take away unused equipment themselves. 15.6. Clicking on the link http://www.eei.lt/about-us/ you will find places where waste from electrical and electronic equipment is collected. Let's keep nature clean by sorting waste! 16.1. All and any notifications, except the cases provided in the Rules, must be submitted to the Seller by email info@keramikams.lt. The Rules shall be fulfilled and all communication between the Buyer and the Seller shall be exercised in the state language of the Republic of Lithuania in writing. Notification sent by email shall be deemed received when 48 hours have passed after its dispatch. 16.2. The Seller reserves the right at any time change, amend or supplement the Sale-purchase rules taking into account the requirements established by legislation. The Buyer registered in the system of the Online store shall be notified about any changes, amendments or supplements at the time of login. The Buyer purchasing products in the Online store agrees with the changed, amended, supplemented Sale-purchase rules. The Buyer expresses his/her consent by submitting an order to the Seller. Only the Buyers who agree with the valid Sale-purchase rules are allowed to acquire products in the Online store. 16.3. Any disputes relating to purchase-sale of products in the Online store shall be settled by negotiation. In the event of failure to resolve disputes by negotiation, they shall be settled in the court of the Republic of Lithuania in accordance with the legislation of the Republic of Lithuania. You have the right to cancel this agreement within 14 (fourteen) days without the specification of any reason. The period of the agreement cancellation shall end after 14 (fourteen) days from the day, when You or a person that You specified, excluding the carrier, receive the ordered item, or You or a person that You specified, excluding the carrier, receive the last item - if the agreement under which the Buyer orders more than one item at once is concluded, and they are delivered separately, or when You or a person that You specified, excluding the carrier, receive the last batch or part - if the agreement under which the item is delivered in different batches or in parts is concluded. In order to exercise the right to cancel this agreement You have to notify JSC Suvena, registered and operating in accordance with the laws of the Republic of Lithuania, registration No. 147579612, operating at the address Berzu st. 4, 36237 Panevezys, Lithuania, website www.keramikams.lt, info@keramikams.lt, about your decision to cancel this agreement by providing the unequivocal declaration (e. g. via the mail, fax or email). You can use the enclosed exemplary form, but that is not necessary. You can also file and submit the exemplary agreement cancellation form or any other unequivocal declaration electronically on our website www.keramikams.lt. If you utilized this possibility, we will immediately send you the confirmation over the durable medium (e. g. email) the confirmation, that we have received such cancellation of the agreement. In order to comply with the time limit of the cancellation, it is sufficient for You to send the notification that you exercised your right to cancel this agreement before the expiration of the period of cancellation. If You cancel this agreement, we will return the money that we received from You, including the delivery costs, promptly and in any case no later than within 14 (fourteen) days from the day, when You notified about your decision to cancel this agreement (except for additional costs that were incurred, when You the other method of delivery instead of the cheapest method of the standard delivery that we offered). In cases, when the Buyer returns only one or several, but not all items that were delivered, the item return costs are not compensated to him, if the amount of delivery does not depend on the quantity, value or other properties of the delivered items. In cases, when the amount of delivery depends on the quantity, value or other properties of the delivered items, the buyer is returned the share of the delivery costs by which the costs of delivery increased when compared with one that would have been paid by the Buyer if he had not ordered the item(s) that is(are) being returned. We will perform such return by using the same method of payment that You used during the performance of the initial payment operation, unless You clearly agreed to another method; in any case You will not have to pay any fees that are related to such return. After cancelling the concluded agreement, You must send the items back or transfer them to JSC Suvena, registered and operating in accordance with the laws of the Republic of Lithuania, registration No. 147579612, operating at the address Berzu st. 4, 36237 Panevezys, Lithuania, promptly and in any case no later than within 14 (fourteen) days from the day when you informed of your decision to cancel this agreement. The time limit is not breached, if You sent the items before the expiration of the 14 (fourteen) day time limit. After cancelling the concluded agreement You will cover the direct costs of the return of the items. We can avoid compensation of the payment till we recover the items, or until You provide the evidence that you sent the items, depending on what happens sooner. If in case of the agreement that was concluded outside the sale premises the items due to their nature ordinarily cannot be returned by mail and were delivered to the house of the Buyer during the conclusion of the agreement, We will collect the items at our expense. You are responsible only for the reduction of the value of the items that occurred due to the actions that were not necessary for the determination of the item's nature, properties and functioning.